After a federal court ruling shuts kitchen staff out of tip pools, some East Bay restaurants again mull tip-free compensation models. Bert Johnson/File photo Liz Sassen (center), who co-owns Homestead with her husband Fred, abolished tips for front-of-house staff after Oakland's new minimum wage was approved by voters. At restaurants around the country, it has long been common practice for servers to "tip out" at the end of a shift, giving a cut of their tips to the bussers and bartenders — and, often, to the back-of-house kitchen employees, such as the line cooks and dishwashers. After all, one good turn deserves another, and for a waiter whose tip is often tied to the timeliness and skill of the kitchen team, it only seems decent to spread the wealth. But because of a recent 2–1 decision from the Ninth Circuit Court of Appeals, that kind of tip-sharing arrangement is now illegal — at least in cases when a restaurant tries to make it mandatory. The case in question (Oregon Restaurant and Lodging Association v. Perez) is of particular relevance to dining establishments in California, where some restaurateurs have taken advantage of the previous legal gray area to give their cooks and dishwashers some extra money. Here in the East Bay, at least a couple of restaurateurs said the recent court ruling might prompt them to reconsider their compensation model — to perhaps move toward an all-inclusive, tipless approach. 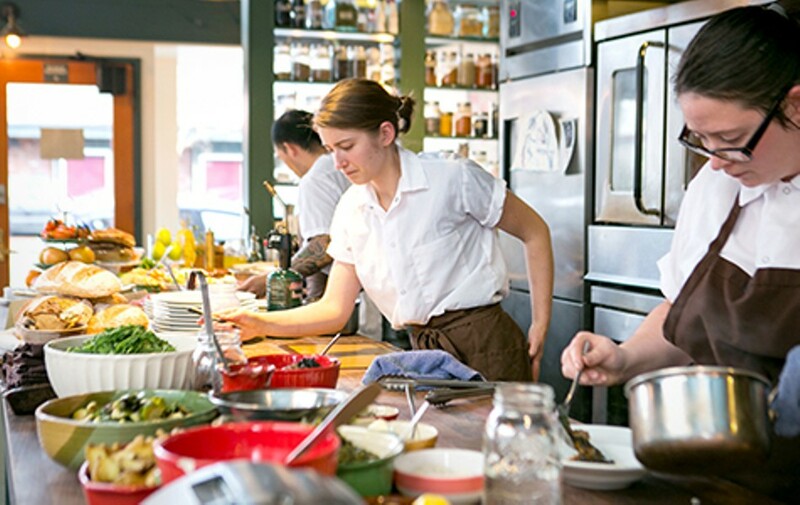 The backdrop for all this is a growing sense, industry-wide, that there is an untenable pay disparity between front-of-house and back-of-house employees at restaurants. For my February 18, 2015 cover story, "The Tipping Point," which examined the effect of Oakland's then-looming Measure FF minimum wage increase on local restaurants, restaurateurs told me it wasn't uncommon for a server to make more than three times as much as a typical line cook, once tips were factored in. The minimum wage increase, which primarily benefited servers (who make minimum wage plus tips), only exacerbated that disparity. 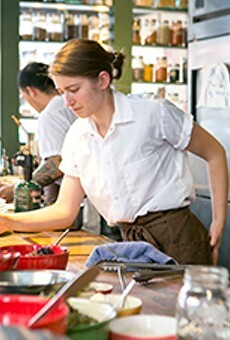 At the time, a number of Oakland restaurateurs, including Sal Bednarz (Actual Cafe, Victory Burger) and Preeti Mistry (Juhu Beach Club), said the minimum wage hike would likely lead them to be even more aggressive in their tip-pooling policies, as a way to make sure that cooks and dishwashers would also reap some of the rewards of the change. In an email, Bednarz said he found the court ruling "worrisome" and that it likely pushes him "one step closer to tipless service" — though he still has deep reservations about how successful that would be at counter-service restaurants like the ones he runs. Meanwhile, Jay Porter (The Half Orange, Salsipuedes) said that while he believes the federal court ruling will eventually be overturned, he is thinking about instituting a 20-percent service charge in place of tips for the time being. In some ways, the fears over the legal and financial ramifications of the court decision provides some measure of validation for the small handful of Oakland restaurants that did go tipless in response to the minimum wage increase. At Homestead, co-owners Fred and Liz Sassen abolished tips last March and simply raised their prices by 20 percent across the board — a move that allows them to distribute that revenue however they see fit. The upshot was that cooks and other back-of-house employees all received a sizeable raise. Servers, on the other hand, got paid significantly less, once tips were taken out of the picture. Of course, one of the reasons the tipless movement still hasn't taken off in the Bay Area is because it is not without its challenges — most notably, in terms of retaining experienced waitstaff. 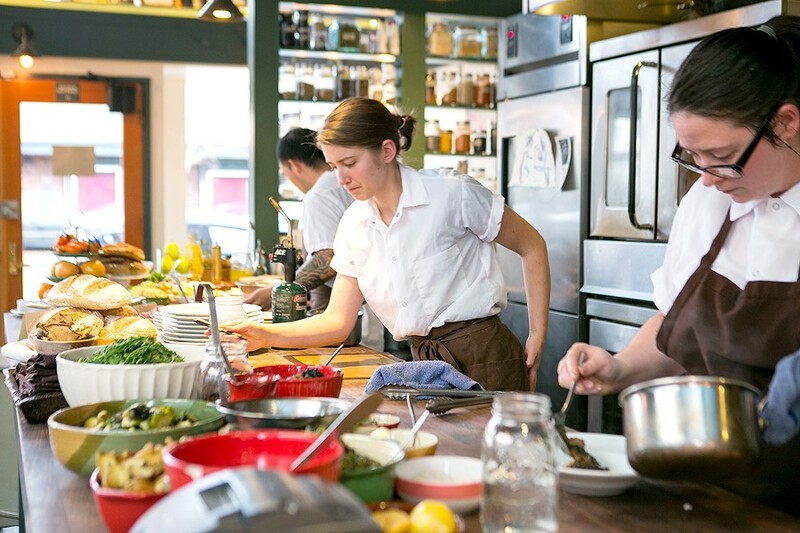 Homestead's Liz Sassen acknowledged that the restaurant lost almost its entire front-of-house staff in the immediate aftermath of the change — an understandable development, given that a server might make $10 or $15 more an hour with tips at another restaurant nearby. And even now, she has trouble hiring the most experienced servers, who know they can make a lot of money pulling in big tips. Instead, the restaurant's new approach is to hire less experienced workers and simply give them a lot of training up front. But Sassen said she has no regrets: "I can look my line cooks in the eye and know that they're getting a fair cut," she said. Since replacing those initial departees, the restaurant has had almost zero staff turnover — a product, Sassen believes, of an improved staff culture. And, of course, the restaurant is unaffected by any current and future legal rulings related to tipping. Many restaurateurs have talked about how difficult the minimum wage increase has made it to do business. She said she wants them to know that, with the tip-free model, "We're not struggling that badly." Ultimately, though, Sassen believes that even with the court ruling, most restaurants will just continue to do what they're doing. Indeed, at Juhu Beach Club, Mistry said that she feels comfortable continuing her tip-sharing policy because it isn't strictly mandatory. Upon hiring, all of her employees are made to understand that the expectation and the culture of the restaurant is for servers to give some cut of their tips to the back of the house. But the servers are free to decide exactly how much on their own, and Mistry herself never touches their tip money. Similar to Sassen, Mistry said the important thing is trying to create a sense of camaraderie and fairness among her staff — both in the front and back of the house — so that when the party of six comes in ten minutes before closing, the cooks feel like they benefit, too. That said, Mistry believes that the tip-free model will eventually become the norm. "I look forward to being part of it," she said.